have not been in breach of the immigration rules at any stage during the three-year period. The residential qualifying period will be worked out from the day we receive your application. Most unsuccessful applications fail because the applicant was not present in the United Kingdom at the beginning of the residential qualifying period. You must make sure you meet this requirement before you make your application. For example, if we received your application on 25 November 2005, you would have to show that you were in the United Kingdom on 26 November 2002. You must be free from immigration time restrictions on the day you make your application. The type of visa that one is on for the start of the qualifying period does not matter, what is important is that the applicant was in the UK legally 3 years before the application for naturalisation and the time out of the UK falls within the parameters. The parameters are the time spent out of the UK is not more than 270 days in the 3 years with less than 90 days in the last year. Now let's assume that someone arrived on a tourist/visitor visa and spent a total of 88 days in the UK on the tourist/visitor visa then returned home and applied for and received a spouse visa and came back to the UK 180 days after the last departure on the tourist/visitor visa that person would be eligible to apply for naturalisation 7 days after obtaining the ILR. Of course according to the fictitious calculation above the applicant would not be able to leave the UK for even one day after arriving with the spouse visa, but it must be taken into account that under normal circumstances waiting six months or a spouse visa is not that common. The main purpose of the calculation was to show that one does not have to wait a full year after obtaining an ILR before they can apply for naturalisation. 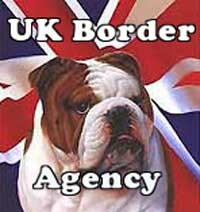 To view the UKBA web page that I have quoted please scroll back to the image of the Bulldog and click on it. This post provides information about British citizenship and other forms of British nationality. It explains how you can apply for British citizenship and other forms of British nationality, and how you can give up your citizenship. Depending on your current citizenship or nationality, you may be able to apply in several ways. You should read the requirements for each type of application that is relevant and decide which is best for you. If you are unsure if you meet the requirements, you may want to take professional advice from a solicitor or from an immigration adviser registered by the Office of the Immigration Services Commissioner (OISC). The information available and provided on this site is not intended to be comprehensive, and many details which are relevant to particular circumstances may have been omitted. It is not a complete statement of UK immigration and nationality law or policy. Before you make an application, you must read the UKBA guide that accompanies the application form, which contain more detailed information. British citizenship is one of the six different forms of British nationality. Some of these were defined in the British Nationality Act 1981, which came into force on 1 January 1983. The laws defining how citizenship can be obtained changed on that date, which is why you will often see references to 1983.
Who can apply for British citizenship and British nationality? Depending on your current citizenship or nationality you may be able to apply in several ways. You should read the requirements for each type of application that is relevant and decide which is best for you. If you are unsure if you meet the requirements, you should contact the UKBA for advice. Can I be naturalised as a British citizen? If you are over 18 and have been living in the United Kingdom for the last five years (or three years if you are married to or a civil partner of a British citizen) you may be able to apply for naturalisation as a British citizen. You may also be able to apply for naturalisation if you or your husband, wife or civil partner is in crown or designated service outside the United Kingdom. Applications for naturalisation are made using application form AN. This section explains some of the requirements you need to meet if you want to be naturalised as a British citizen. The information in this section is an introduction to the requirements. Applications for naturalisation must be made using application form AN, and you must read the accompanying Guide AN before you make your application. You can download the form and the guide from the Applying section. Please ensure that you read Guide AN to find out whether you can apply. You will need to pay a fee when you make your application - and if your application is unsuccessful because you are not eligible, we will not refund your fee. Most applicants will need to meet the standard requirements for naturalisation. If you are the husband, wife or civil partner of a British citizen, you need to meet the requirements for spouses and civil partners. If you meet the requirements for naturalisation, you can find out how to apply in the Applying section. How do I apply for naturalisation as a British citizen? To apply for naturalisation, you should use application form AN. Before you apply, you should ensure that you have read the section on eligibility. You must be aged 18 or over to apply for naturalisation. If you are under 18, you should read the section on registering a child as a British citizen. Before you make your application, you should read the guidance documents, Booklet AN and Guide AN. These provide full details of the requirements that you must meet, and how to complete the application form. You will need to confirm on the application form that you have read and understood both documents. Guide AN, section 9 refers to the leaftlet 'Wiping the slate clean', this leaflet is no longer available. To find information on the Rehabilitation of Offenders Act 1974, see the Ministry of Justice website. You can download the documents as a single PDF Booklet AN and Guide AN. Details of the requirements you must meet before we can naturalise you as a British citizen. If you are married to or a civil partner of a British citizen, the requirements you need to meet are different; you should read the Spouses and civil partners page for more details. You must intend to continue living in the UK, or to continue in Crown service, the service of an international organisation of which the UK is a member, or the service of a company or association established in the UK. You must have sufficient knowledge of life in the UK. When does the residential qualifying period start? The residential qualifying period is calculated from the day when the UKBA receive your application. Most unsuccessful applications fail because the applicant was not present in the UK at the beginning of the residential qualifying period. You must make sure you meet this requirement before you make your application. For example, if they receive your application on 25 March 2010, you must show that you were in the UK on 26 March 2005. If you have spent time in the UK while you were exempt from immigration control, you cannot include this time as part of the residential qualifying period. If you were in the UK as a diplomat or as a member of visiting armed forces, or if you were in any place of detention, you are considered to have been exempt from immigration control during that time. This time is treated as absence from the UK when they assess your application. You must be free from immigration time restrictions when you apply for naturalisation. Unless you are married to or the civil partner of a British citizen, you should have been free from immigration time restrictions during the last 12 months of the residential qualifying period. If you are free from immigration time restrictions, there will probably be a stamp or sticker in your passport saying that you have indefinite leave to enter or remain or no time limit on your stay. But you may have a letter from the Home Office saying that you are free from immigration conditions. See The documents we require for naturalisation applications for details of how to prove you are free from immigration time restrictions. We have discretion to allow applications from people who do not meet this requirement. For details of how we apply discretion, you should read the Discretion on immigration time restrictions page. If you are a national of a country in the European Economic Area (EEA) or Switzerland, or you are the family member of such a person, you will automatically have permanent residence status if you have exercised EEA free-movement rights in the UK for a continuous five-year period ending on or after 30 April 2006. You do not need to apply for leave to remain. You should have held permanent residence status for 12 months before you apply for naturalisation. all absences were for under 12 months and were for important reasons such as pregnancy, childcare, serious illness, study, vocational training or an overseas posting. If you leave the UK for a continuous period of two years or more, you will lose your permanent residence status. If you have indefinite leave to remain (ILR) in the UK, you will be considered to be settled here provided that you have not been away for two years or more since you received ILR. You must have been in the UK legally throughout the residential qualifying period. We may refuse your naturalisation application if you have breached the immigration laws during that period. During the residential qualifying period, you must not have been absent from the UK for more than 450 days. You must not have been absent for more than 90 days in the last 12 months. We have discretion to allow absences above the normal limits. For details of how we apply discretion, you should read the Discretion on absences from the UK page. have a close connection with the UK. Crown service is an alternative only to the residence requirements for naturalisation. You must still meet the other requirements for naturalisation. Here you can read details of the requirements you need to meet for us to naturalise you as a British citizen. The information on this page is only relevant if you are married to or the civil partner of a British citizen; you should read the page on standard requirements for naturalisation if this does not apply to you. You should read the information on this page before you make an application for naturalisation. You will need to pay a fee when you make your application. If you make an application for naturalisation and it is unsuccessful because you are not eligible for naturalisation, we will not refund your fee. If you meet the requirements for naturalisation you should go to the applying for naturalisation as a British citizen section for details on how to apply. your husband, wife or civil partner is in Crown or designated service outside the United Kingdom. If you are a European Economic Area (EEA) national or a Swiss national or the family member of such a person, you will automatically have permanent residence status if you have exercised EEA free-movement rights in the United Kingdom for a continuous five-year period ending on or after 30 April 2006. You do not have to apply for leave to remain. If you leave the United Kingdom for a continuous period of two years or more you will lose your permanent residence status. If you have indefinite leave to remain (ILR) in the United Kingdom you will be considered settled providing you have not been away for two years or more since you received ILR. You must have been in the United Kingdom legally throughout the residential qualifying period. We may refuse your naturalisation application if you have breached the immigration laws during the residential qualifying period. If you came to the United Kingdom as an asylum applicant, you would be considered in breach of the immigration rules if your application for refugee status and any appeals were refused during the residential qualifying period. You would also be in breach of the immigration rules if you entered the United Kingdom illegally and obtained refugee status during the residential qualifying period. During the residential qualifying period you must not have been absent from the United Kingdom for more than 270 days in the last three years. You must not have been absent for more than 90 days in the last 12 months. There is discretion to allow absences above the normal limits. For details of how we apply discretion, you should read the page on discretion when considering absences from the United Kingdom during the residential qualifying period. your marriage or civil partnership has lasted more than three years. Marriage or civil partnership to a British citizen in crown or designated service is an alternative only to the residence requirements for naturalisation. You must still meet the other requirements for naturalisation. If you speak English, Welsh or Scottish Gaelic to a reasonable standard, you will need to pass the 'Life in the UK test'. If you do not have sufficient knowledge of English, Welsh or Scottish Gaelic, you will need to take and pass an English for Speakers of Other Languages (ESOL) course in English and citizenship. If you passed the Life in the UK test or completed an ESOL course to meet the 'knowledge of language and life' requirement when you applied for settlement, you will not need to show that you meet this requirement again. Simply tick the appropriate box in section 1.22 of the application form. You may be exempted from the requirement if you are over the age of 65, or have a serious physical or mental condition that would prevent you from meeting this requirement for the foreseeable future. These are details of the documents that you must send the UKBA to support your application for naturalisation. You should send the original documents, not copies. You should provide translations of any documents not in English. If you want the UKBA to return your valuable documents by secure post, you must enclose a pre-paid, self-addressed Royal Mail special delivery (or recorded signed-for delivery) envelope with your application. The envelope should be able to accommodate the size and weight of your documents, and should be insured to the appropriate level for the documents' value. If you do not enclose this envelope, the UKBA will return your valuable documents to you by Royal Mail 2nd-class post. See the Royal Mail website for further information. The documents required depend on the basis of your application. The list below has been split into 5 sections; you should ensure that you read all the sections that are relevant to you. If you do not send the UKBA all the documents that they need, they will write to ask you for them; this will delay your application. You can download a document checklist (PDF 25K opens in a new window) containing details of the evidence they require. You should read the information below for details of the types of documents they will accept as evidence. bank, building society or credit card statements issued to you in the last 6 months. 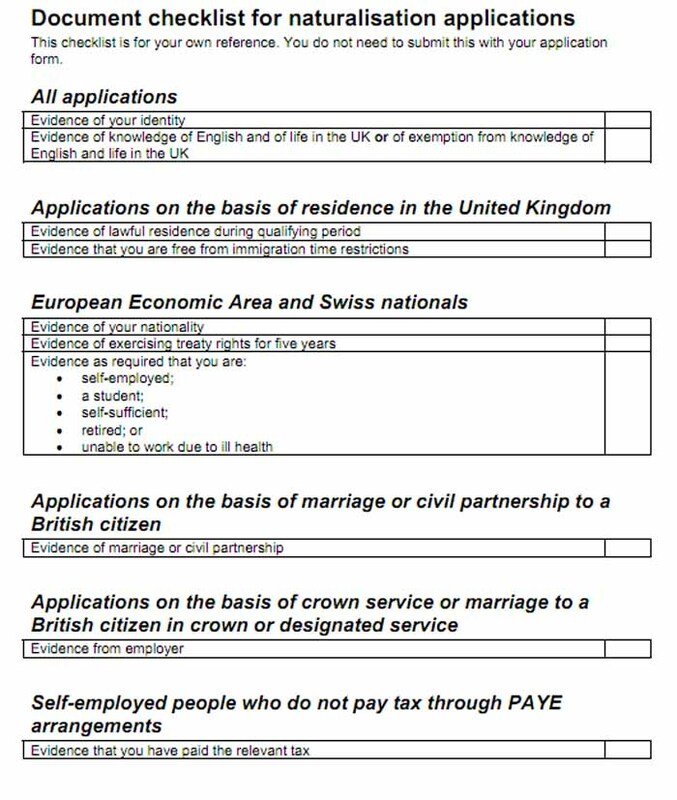 If you used one of these documents to prove your identity when you took the 'knowledge of life in the UK' test, you should supply the same document to support your naturalisation application. your confirmation that you met this requirement in order to obtain settlement. If you are applying from the Channel Islands or the Isle of Man, you should contact the Lieutenant Governor for details of the evidence required. If you are applying from any other country, you should contact your nearest British diplomatic post for details of the evidence required. You should provide evidence from your doctor that it is not a temporary condition. You should provide your passport. If you cannot provide your passport, you should explain why on page 13 of the application form. If you do not provide your passport, you should provide letters from employers, educational establishments or other government departments indicating your presence in the UK during the qualifying period. If your passport is not stamped when you enter the UK (because you have the right of abode in the UK, or you are a national of Taiwan or the Turkish Republic of Northern Cyprus), you should send your passport and alternative evidence of residence. This evidence could take the form of letters from employers, educational establishments or other government departments to show your presence in the UK during the qualifying period. the Home Office letter giving you permission to remain in the UK permanently. If you came to the UK as an asylum seeker, you should provide evidence that you were not in the UK without permission between exhausting your appeal rights and being granted indefinite leave to remain. If you entered the UK before 1971 and were not put under immigration time restrictions, you should provide evidence that you were freely landed as a Commonwealth citizen before 1971 or because you arrived as a child on your parent's passport. documentary evidence confirming pension received. If you are self-employed or a businessperson, you should provide evidence from HM Revenue & Customs confirming that you have paid tax over the relevant period. evidence that you have comprehensive sickness insurance cover for you and your accompanying family members. If you are retired, you should provide evidence that you are receiving a state pension. If you have been unable to work due to ill health, you should provide a doctor's letter or medical report confirming that you have been unable to work. The letter or report should state whether you are likely to be able to return to work. the extent to which it would be in the employer's interest for the application to be granted. If you do not pay tax through Pay As You Earn (PAYE) arrangements, you should provide the most recent HM Revenue & Customs self-assessment statement of account. This is a piece of cake compared to what we have been through.